In a food processor, pulse flour, cornmeal, sugar, and salt several times to combine. Add butter and pulse until mixture resembles coarse meal with a few pea-sized pieces remaining. Add 2 tablespoons ice water; pulse until dough is crumbly but able to hold together when squeezed. Add more water if needed, but do not over-mix. Turn dough out onto floured surface, and knead once or twice. Flatten dough into a disk, wrap it in plastic, and refrigerate for at least an hour. Line a rimmed baking sheet with aluminum foil. Flour a large piece of parchment paper. Place dough over paper. Using your knuckles, press edges of dough so it doesn’t crack during rolling. Lightly flour top of dough to prevent sticking; roll out to a 14-inch round. Transfer dough (still on parchment) to prepared baking sheet. 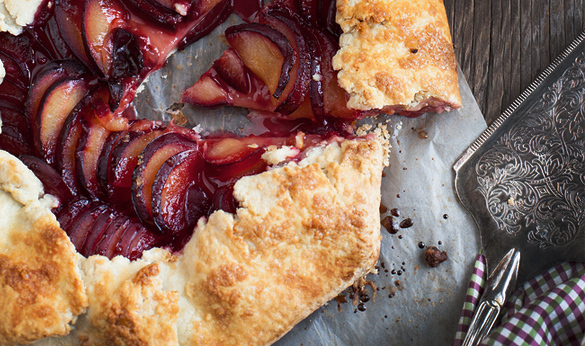 These plum tarts are great to prepare ahead of time, and taste even better after sitting for a few hours.